Amazing Oceanviews from the Master Bedroom of Direct Oceanfront Townhome#4 at Keauhou Kona Surf & Racquet Club!! Gorgeous Direct Ocean views from your living room area..This pullout sofa sleeps 2! Direct Oceanfront Dining for 6!! Tastefully decorated, all the amenties you'll need! Master bedroom features beautiful ocean views. Hear the sound of the water while you wake up! Master bathroom upstairs features a tub/shower combo. Ocean views everywhere! 2nd bedroom has 2 comfortable twin sized beds that could be pushed together to make 1 if you wish to do so! Another angle of the back of the townhouse looking south. Looking into the townhome from the ocean side. Straight ahead of those trees is the beach!! Looking directly into the townhome from the ocean. The foyer of Townhouse#4. Welcome! Welcome to Direct Oceanfront Townhouse#4! To the right is the direct pathway to the beach! Literally steps away!!! 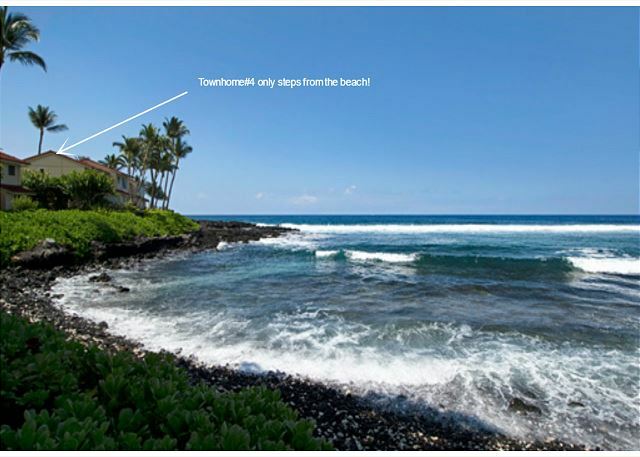 As you can see, townhouse#4 is literally steps from the beach!! 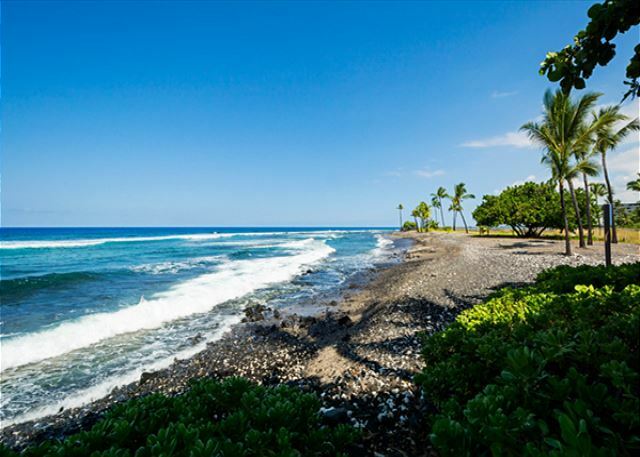 The beach that Keauhou Kona Surf & Racquet Club Townhomes sits on! Gorgeous pool area just remodeled in 2016! 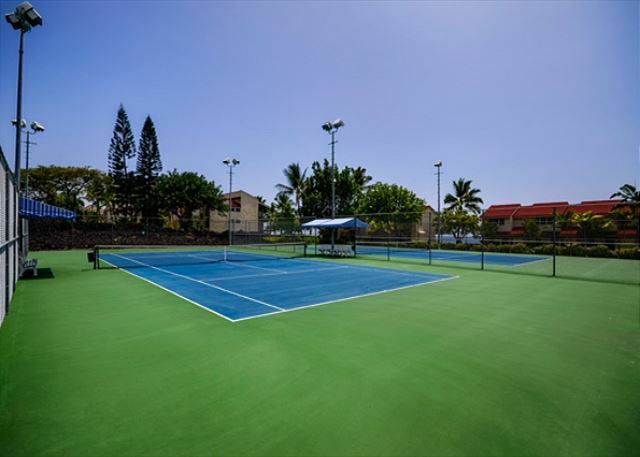 Tennis Courts for your use! Looking to stay direct oceanfront & within steps to the beach? Look no further, you've found the perfect property! Welcome to the page of our direct oceanfront, townhome#4 at the Keauhou Kona Surf & Racquet Club. We're extremely proud to be newly managing this amazing remodeled townhome. Have a larger group? We also manage Townhome#3 RIGHT NEXT DOOR! Inquire within! This property sleeps 6, and the property next door sleeps 4! A great option for 10 to be RIGHT NEXT TO THE BEACH! Step into your own enchanting tropical hideaway! Ocean front just steps from a lovely beach and lagoon, this beautifully designer decorated town home awaits your arrival. The main living area is downstairs, including new furnishings with a sofa sleeper, a full bath with tiled walk in shower, and a charming outdoor dining area (for 6) to sit and watch the sunsets. This unit has comfortable furnishings and decor, granite countertops, tiled flooring, and a fully stocked kitchen. 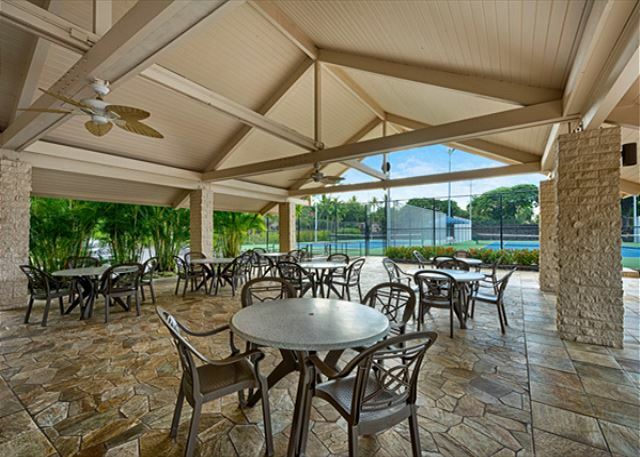 Other amenities include: large flat screen TV in the main living area, king bed in the master, 2 twin beds in the guest room, ceiling fans in every room, DVD, free WIFI, indoor and outdoor dining, in-house washer/dryer, and on-site community BBQ. VOIP telephone with free long distance to North America. Kahalu'u Beach Park is a 5 minute walk away with superb snorkeling. 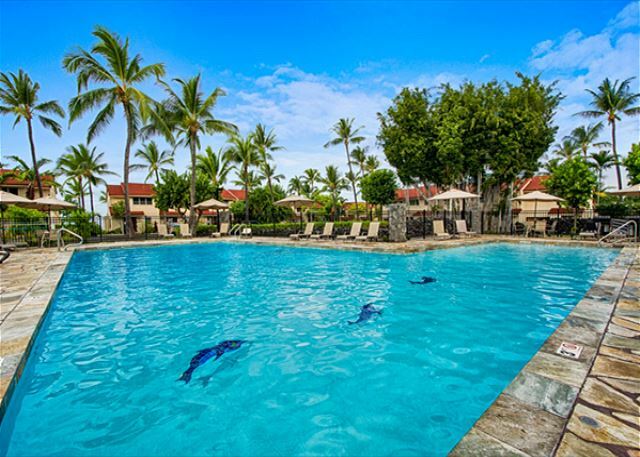 Tidepooling and beach play are just steps from our lanai. Ancient Hawaiian petroglyphs are at the end of our beach near the restored heiau. We had a great time. We overlooked the fact that the unit did not have Air conditioning which led to some discomfort from some of the attending guests. There was also snorkeling gear and beach gear that we discovered in back that we did not know about. We also added 3 brand new sets of Snorkeling gear to the collection as we could not bring it home with us. Overall our stay was nice. The pool was well maintained. Wish there were more grills available to use, but we managed. Thanks for the great Memories. Aloha! We're sorry to hear that there were not many grills available and that the heat made some of your party uncomfortable, but will keep that in mind for plans to improve guest experiences at this unit and will make every effort possible to remedy this and let property owners know. Thank you for your addition to the snorkeling collection, and we are sure future guests will be grateful too! We're happy we could help you make some great memories on the Big Island and hope to accommodate another stay for you! Very nice condo right on the ocean. lots of beach stuff, boogie boards, snorkeling equip, chairs, etc. Beautiful location, relaxing and quiet. Perfect condo. The location is great, listening to waves all night was wonderful. Condo was well equips, we enjoyed using the boogie boards, beach chairs, ice chest, and snorkeling equipment. Saved us the cost and time to rent these items. I had my daughter and 18 month old grandson. The pool is kid friendly and the grounds are well maintained are well maintained. A safe and quiet place. Grocery store and some restaurants, snorkeling beach all within walking distance. We really enjoyed our stay at the townhouse #4!! It has an awesome view of the ocean amd just a quick few steps from the beach which we used every day and night! The townhouse suited my family well! Everyone was very happy with their stay!! Thanks for a great location and townhouse!!! 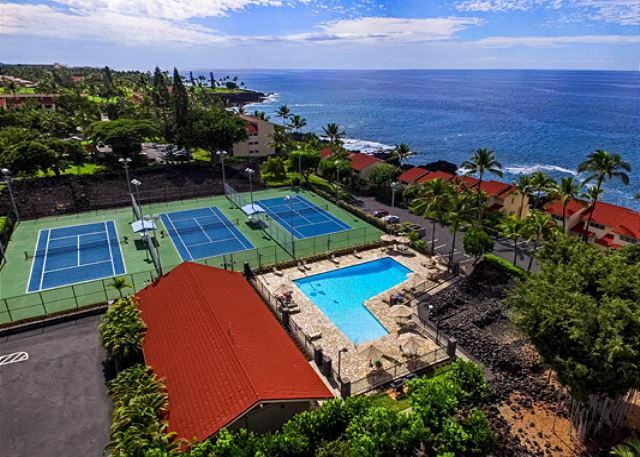 This townhome was in a great spot right on the main road through Kona, so it was easy to get to all of the popular beaches, shops and restaurants. They mean it when they say it's just steps from the beach! We had an amazing view from the patio and although it rained the whole time we were there, we couldn't have asked for a better spot. The fixtures/decor didn't strike us as "remodeled" necessarily, but we didn't see what the neighboring units looked like. Everything was very neatly kept and super-clean, and service was excellent. The management team was very communicative and housekeeping was great, too. They use a "hospitality" app to keep you updated with check-in instructions, gate/door codes and other helpful info along the way. Everything was simple and easy. One minor piece of advice: bring walking shoes! We grabbed some "water shoes" at Long's in the shopping center up the hill because even our closed-toed shoes were letting in lots of small rocks. It's a rocky beach but beautiful to walk along if you get to. Great location, great view, quiet and relaxing. Had everything we needed. There were a lot of sugar ants so need to be sure no food is left out. We didn't see any smoke detectors but we may have just overlooked them. This rental was just as described and better. Blake took such good care of us including calling to let us know we could go in a little early. The rooms were clean and comfortable and there was plenty of room to walk and not be on top of each other. There was coolers to use which we did, and snorkel gear, beach chairs and beach towels. The beach was beautiful and we saw turtles, fish, and sea urchins every day and even a sea cucumber. The kitchen had everything you need to cook or fix anything you want, we made margaritas and having an ice maker was a bonus. My one suggestion is always close the screens because the little black flying bugs can be annoying. After figures that out there was no problems. Having 2 full bathrooms was was great and a full size washer and dryer was very convenient and it was nice not to have to pack up dirty clothes. The location of the condo was great and made it possible to just go on little adventures which we love. The proximity to 2 step beach is amazing and the snorkeling there was so beautiful. We very much look forward to staying in this beautiful condo again and hopefully soon. Great location. Full ocean view. Have been to Kona numerous times over the years and enjoyed being on the quieter end of Alii Drive with access to open oceanfront land. Also close to amenities such as KTA & fresh markets. Unit was very well equipped & comfortable. But would suggest some basic interior updating/maintenance such as re-painting, carpet cleaning/replacement. Everything was wonderful. View was amazing and the town house was very clean. I would definitely stay again but really wish there was air conditioning. Staff was very helpful and pleasant. Very very nice! Beautiful condo, location and grounds! My family and I stayed in this condo this past April and loved everything about it! The beach is steps away from the condo's lanai and it felt like our own private beach. We saw sea turtles in the tide pools as well as corals and a lot of colorful fish. We took advantage of the Surf and Racket Club's pool on multiple occasions - the grounds are beautifully maintained and the pool was clean and warm. We found the condo itself to be in great shape and appreciated the well stocked kitchen as well as the beach and snorkel gear provided. We are thankful to our friend who recommended the Surf and Racket Club to us and will definitely stay in this condo again. The owner and Knutson & Associates representatives were very helpful and responsive to our questions. 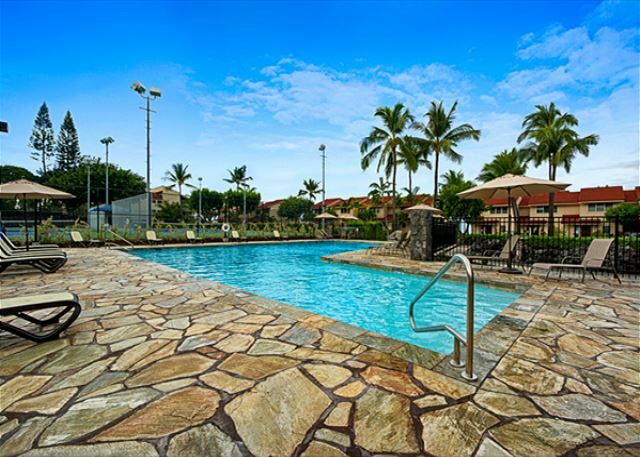 The condo is close to a shopping center as well as Kahaluu Beach Park. Excellent location and experience all around! Nice location. Townhouse generally nice but getting a bit tired in some areas - kitchen cabinets, floor tiles. We had such a great vacation! This unit is so close to the ocean you have to close the windows or the sea spray comes in. The view from the master bedroom is like a postcard. We are already picking dates for next year. Although we only stayed 3 nights at this condo it was the best part of our vacation so far. We are in this area for 6 weeks and absolutely love it. Knutson's is a fabulous agency to work with. Blake has been so accommodating and efficient in his assistance. Thanks so much for this lovely place.